Welcome to 425 Derry Avenue! 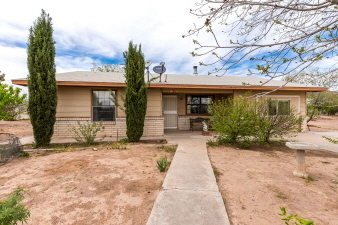 Imagine warming your self by the wood stove in this charming 3 bedroom 1 and 1/2 bath home. The home offers 1153 square feet of living space and is situated on a .44 acre lot. This home built in 1989 has amazing views of the Rincon Mountains, a large open patio and shade trees that offer a relaxing atmosphere for those summer cookouts. The landscaping also includes producing pecan and fruit trees as well as numerous types of flowering plants. The garage has been enclosed and partially finished and has the potential to create a 300 square foot bedroom and bath. There is tremendous potential and an increase in home equity for a buyer willing to finish the garage bedroom and make this property shine.